DJI Flame Wheel Propellers 8"
These DJI Flame Wheel 8" propellers are specially designed to be used with the DJI 2212, 920kv Motors, they have a built in flat sides to match the DJI Flame Wheel motor shafts. The 8" propellers can be used on either the F450 QuadCopter, F330 QuadCopter or the F550 Flame Wheel HexaCopter frames. These propellers are for use with a 4s Lipo pack on the F550 & F450 Flame Wheel frames, if you are using a 3s lipo pack please use the DJI 10" propellers. 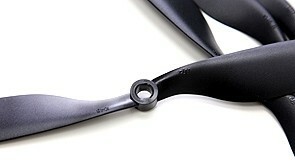 2 x 8" Propellers: 1 x CCW propeller, 1 CW propeller. Nice quality and cheap replacement part! Looks to be a genuine part.. fitted my quad perfectly! just wish it had come with the screws as I had to drill those out because of them being like monkey metal and my allen key stripping the head of the screws! BYOD sent this out immediately and at a very good price. Highly recommended. Can't get too excited about the standard plastic props from DJI though! These props i find are very good,a little tricky to balance due to the flat sides.Work excellent with the 14v lipo's.Anything you here about the props breaking in forums is a load of rubbish from my experience put 6-10 turns of PTFE tape this is used by plumbers for joints and just lightly nip down the bolts.No thread lock,No over tightning equals no breaking props. shipment very fast and accurate.